So it’s true I was at Pilchuck just a month ago, but since Dave was here (did I point out that it’s the perfect excuse to rent a car for a week? 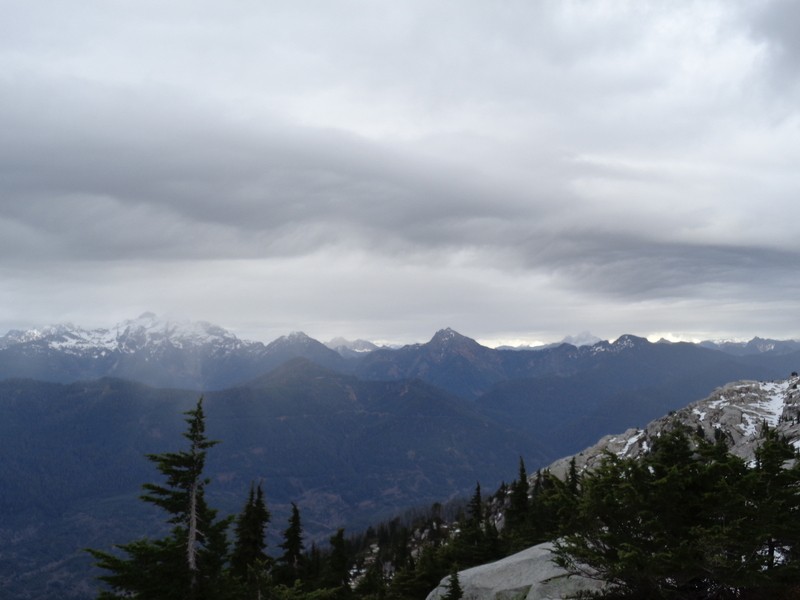 ), I figured it was a good staple hike to check out since it’s not too difficult but gives great views of both the Sound as well as the Cascades. Forecasts were all contradictory. Mountain weather (nwac) seems to be the most optimistic, while weather.com and weather.gov are much more… conservative. The drive there was through those medium altitude, thick clouds, and I had a feeling they weren’t going to clear up anytime soon. But we still gave it a shot! Hiked 2/12/2015. Did I Trip: I don’t think I did? I was still a little worried about the washouts on the road as we drove up to the trailhead. Last time I was there, they were bad, and this time I was in a rental car with less clearance than my old accord. Good news was someone filled them in! Not all the way, but they at least filled in the deepest parts and marked the big rocks along the road. I imagine cars driving over it flattened it out as well, regardless it wasn’t a concern anymore. So we got to the top, parked, and off we went. The neat thing about this hike is that the views start in the parking lot. Sure, you spend some time in the forest, but I like seeing Whitehorse and Three Fingers right off the bat. They were in full view when we got started. 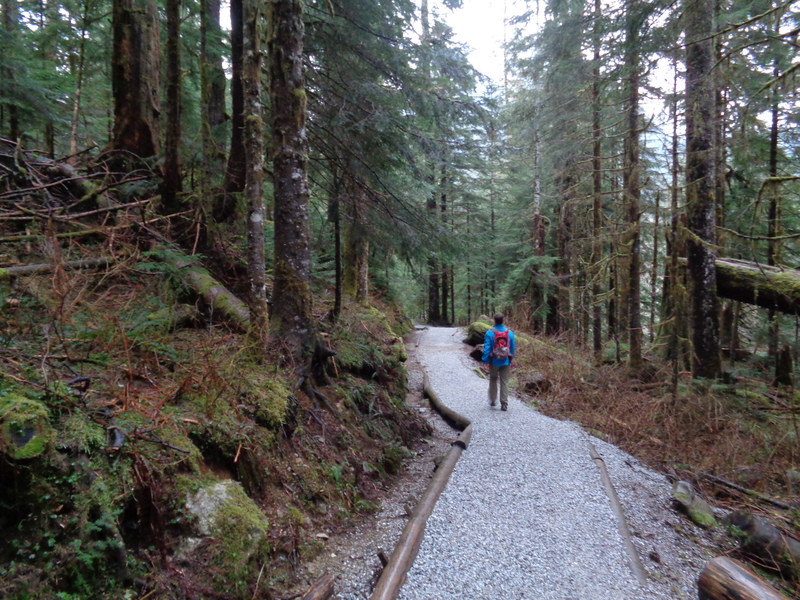 The trail through the forest was a bit wet, but no ice like back in January. Luckily this time I remembered my microspikes and wasn’t stuck lugging snowshoes up just in case. 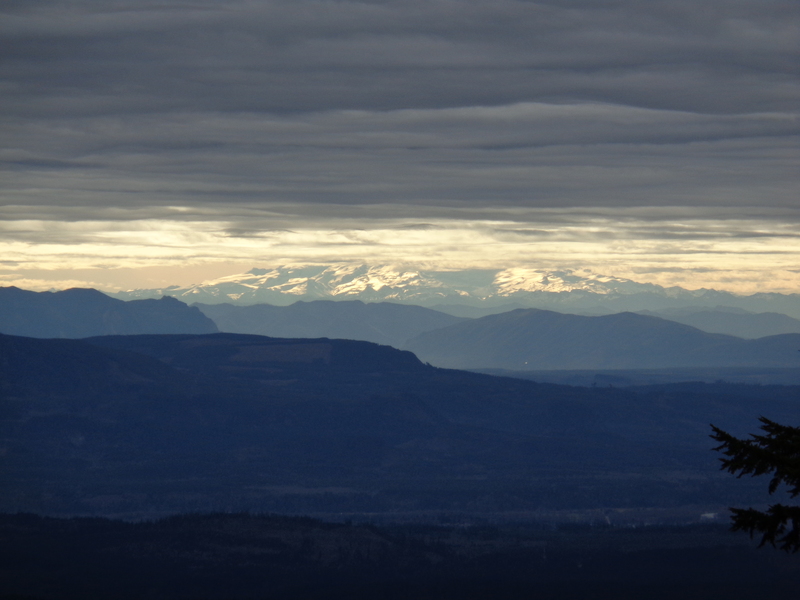 When we first broke out of the forest (briefly) we could see just the base of Rainier, lit up yellow below the clouds. I didn’t even believe it was Rainier at first, until I realized what else could I possibly be looking at? 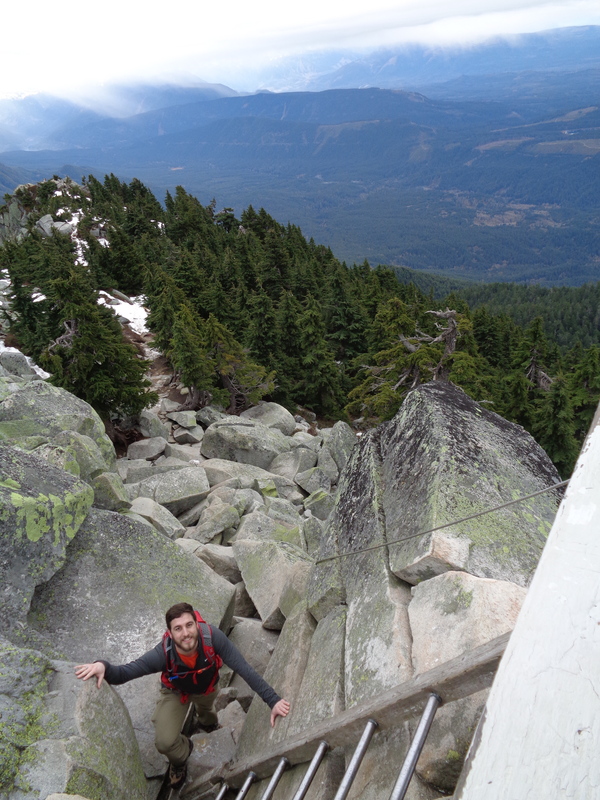 We continued back into the forest, and I realized that despite being short and popular, Pilchuck is fairly technical. Lots of rocks, and surprisingly steep. At one point while hiking through a small boulder field there are some ruins(?) 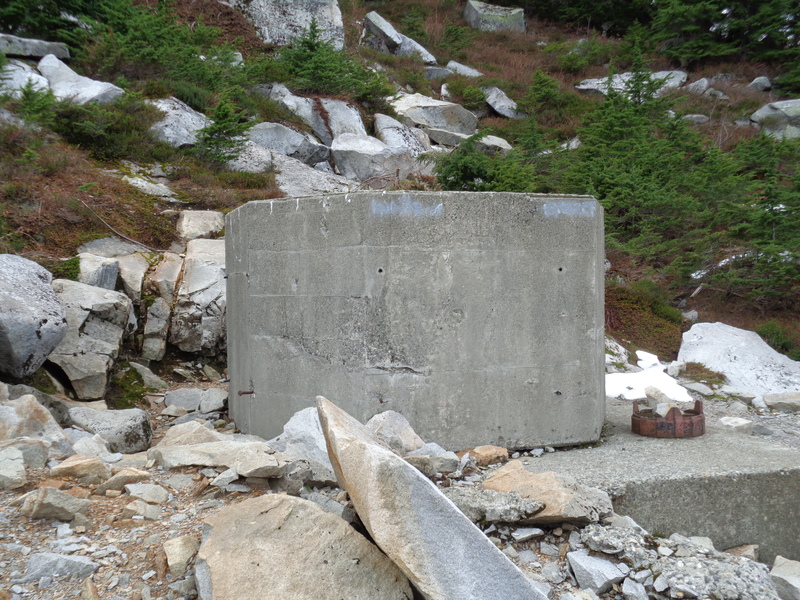 to the right of the trail – I took some pictures, but it looks like some old wires, a pulley system, and a huge concrete bunker-type concrete building (Dave had a better name for it). I have no idea what they could be for. 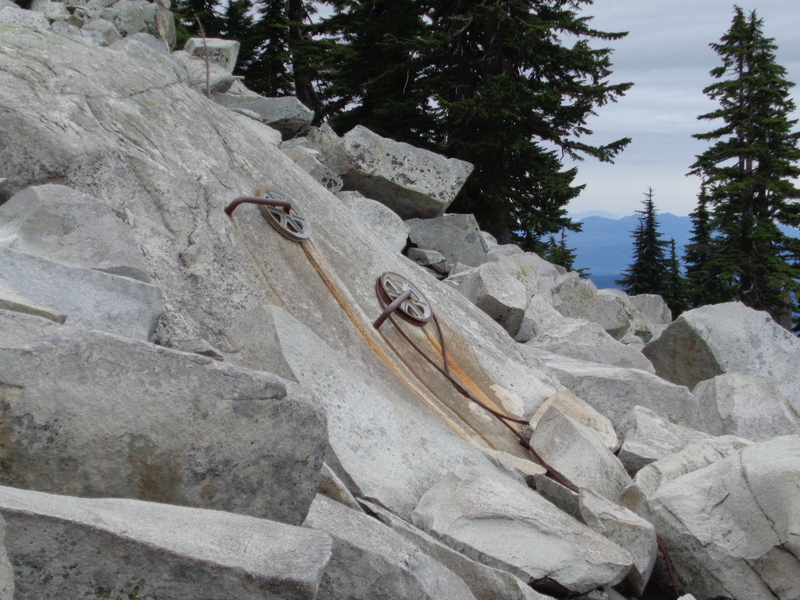 I looked up some Pilchuck history on nwhikers.net, and it looks like they blasted off the top 10 feet of the mountain to build the lookout. To get materials up, they basically winched everything up by hand, so the pulleys could have been part of that? You can see traces of the blasting all over some of the rocks in that area, so it’s possible. But what the hell is the concrete structure for? We didn’t hit snow until the last few hundred (vertical) feet of the trail. It wasn’t quite enough for microspikes. They could have been nice, but we weren’t moving too quickly, and I didn’t feel the need to stop and put them on so close to the lookout and with such a good path thanks to previous hikers. 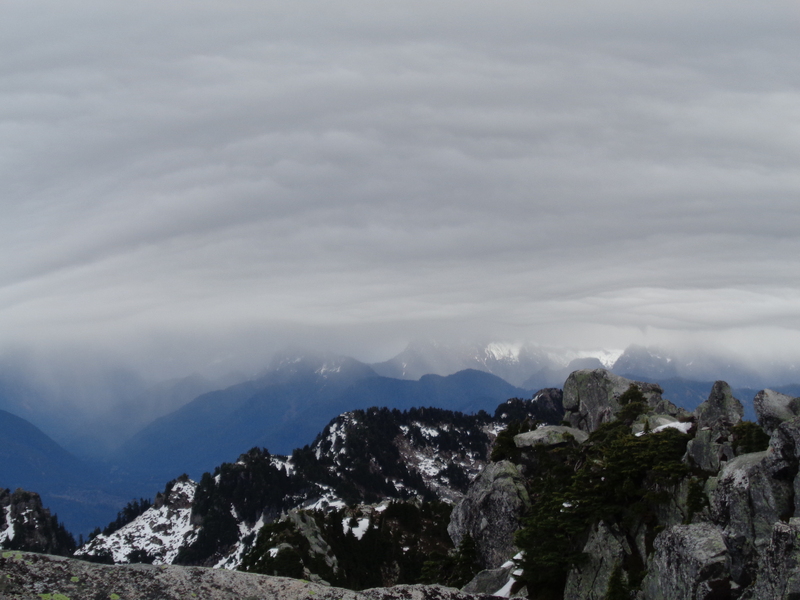 Soon enough, we came to the short scramble to the lookout. I put my poles behind me and started making my way up to the ladder. Damn, it was windy! I got to the balcony. I checked every corner for views. Snapped pics. And I ran to the door and ducked into the lookout. Time for layers! Oh wait, maybe a time lapse? Yeah, a time lapse. Ran outside, wrapped my camera around a trekking pole, and set it on the railing. That way if it fell, it’d only fall five feet instead of off the mountain. Unfortunately, not as many views as last time. No Twin Sisters, no Baker, no Shuksan. Even Three Fingers had disappeared into the clouds. I don’t think Dave ever got to sneak a peek at Glacier, or Sloan. 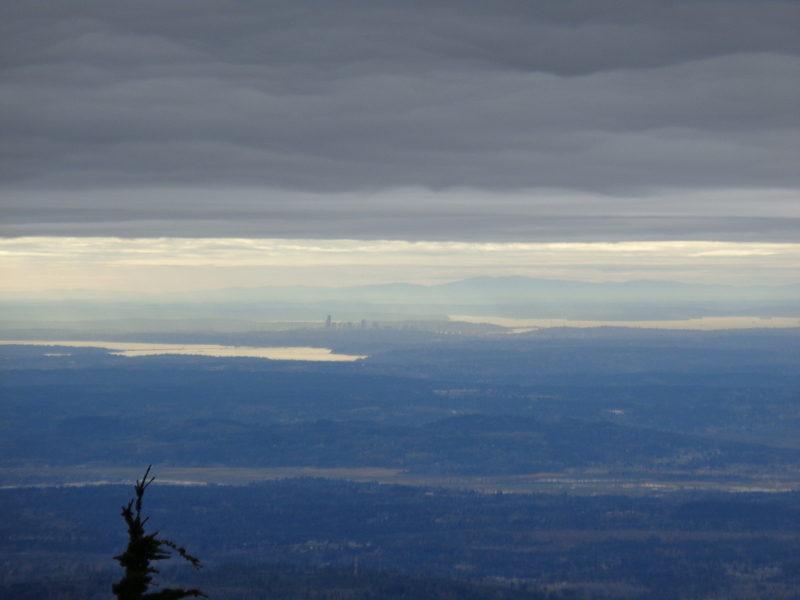 Views towards Seattle were good, and it still feels like the mountains. Also, it was freezing. Back into the lookout! There were a few others in there with us. Two had a freaking feast of soups and sandwiches, while I sat there with my crappy tortillas and storebought hummus. And tea. Thank god for tea. Dave had some killer trail mix too, smores flavor(!) from QFC. We later returned to buy three more boxes. I got a few great recommendations for backpacking trips from one of the guys there, and after 30 minutes we turned around to go back down. I grabbed my camera and followed Dave, and we made pretty quick progress back to the trailhead. Here’s a link to the strava map. And here’s a screenshot. With a solid two hours of daylight left (rainy daylight, but still light) we figured we’d knock off the Big Four Ice Caves as well. It’s a very easy trail. Sections are either paved, covered in gravel, or built on bridges full with even dirt. Nothing tricky to negotiate. 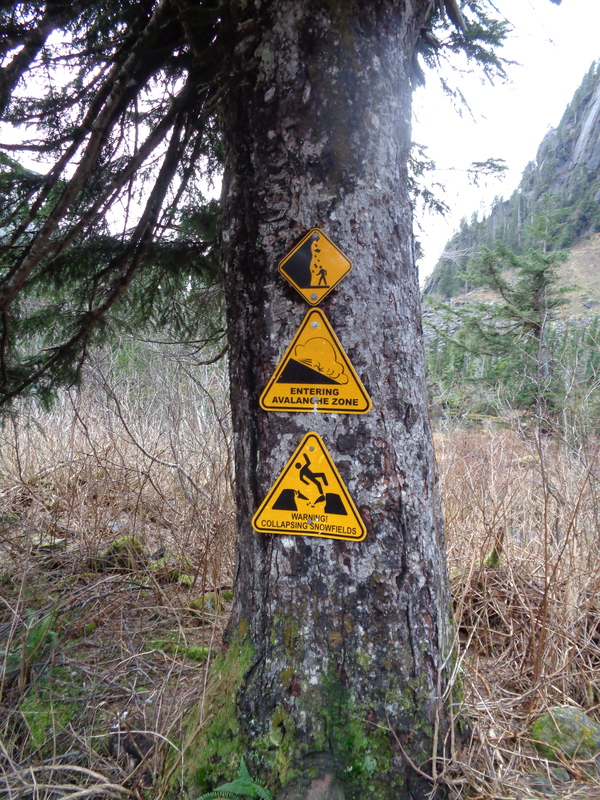 And a warning sign what felt like ever five feet for avalanche danger. It was a quick hike. The forest was pleasant, but we wanted to see the caves. It did look like there were traces of an old trail to the caves, so I’m curious how long ago they built the current one. You don’t get as many glimpses of the Big Four peaks as I expected, but when you break into the avalanche zone below them, you can see small waterfalls cascading down the ridges which was still pretty neat. We did hop off the trail to get closer to the cave, but didn’t go in. There are memorial plaques to a 12 year old who was killed by the caves when a part collapsed, which is definitely a dampener on mood but probably necessary considering how many people go inside to check it out. Even if it wasn’t a long, difficult hike, it was a classic that I needed to get off the list. I had been saving it for a cloudy day, and the time had come. 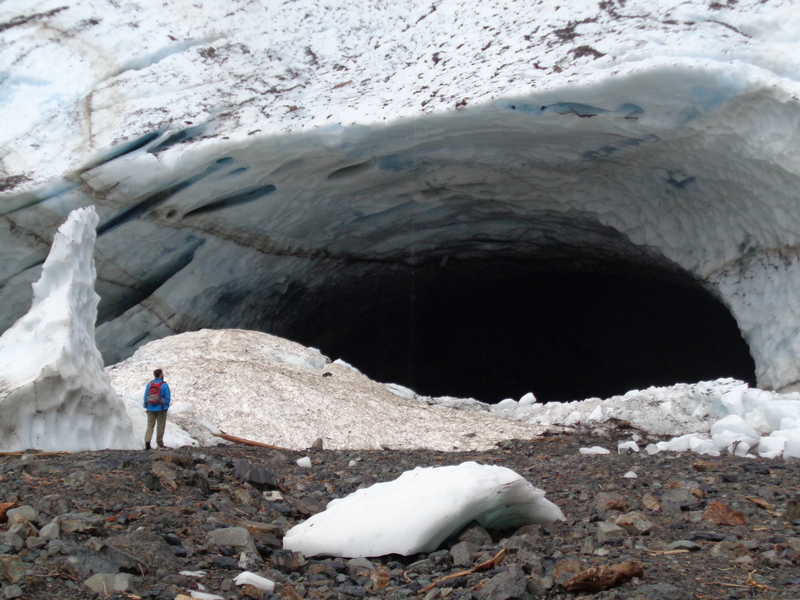 One of the old headline pictures on the wta trail page showed several caves, so I have to wonder how it looks early in summer after a real winter with snow. Aka not what we’re getting right now. I can’t even believe the mountain loop highway is still open. I thought I’d be snowshoeing it by now! Here’s a link to the strava map for the ice caves. Wait! I got a sick panorama at the ice caves. Just found out I can turn the camera vertical and take them that way, and actually try to catch the height of the peaks. Check it out.